Cold case detectives hope a review of an unsolved 1989 murder could help explain why a woman was killed and then dumped 118 miles (190km) from her home. Jeanette Kempton, 32, went missing from Brixton in south London, where she lived with her ex-husband and their two teenage sons, on 2 February 1989. Her partially decomposed body was found in a ditch at Wangford, near Southwold in Suffolk, just over two weeks later. She had no known links to Suffolk but police said her killer may have had. Andy Guy, Suffolk Police's major crime review and unsolved case manager, said the case was reviewed in 2009 and 2016 and "could do with another full forensic review". "DNA technology has moved on and there are questions I've not got the answers to," he said. 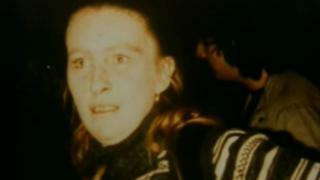 Police said Ms Kempton, known as Jean to her friends, was last seen alive leaving The Loughborough Hotel at about 19:15 on 2 February 1989. Her body was found by two rabbit hunters on the Earl of Stradbroke's estate off the A12 on 18 February. She was missing her coat, a shoe, her purse, a wreath for a funeral she had picked up and jewellery. The cause of death was strangulation. Police said there were five suspects at one point, including her ex-husband, but no-one was convicted. Mr Guy said: "She had no connections to Norfolk and Suffolk and was deposited in a ditch totally out of context. "There were no witnesses and no forensic clues to take you anywhere. "But there could be someone out there who knows something and that could turn things around very quickly." He said the person who dumped her body most likely had connections with the north-east Suffolk area. The case featured on BBC One's Crimewatch in May 1989 in an attempt to get more information, but police appeals led to nothing.